Ford Motors had launched all-new Ford EcoSport with host of features combining a new powerful engine with a 6-speed Automatic Transmission last year. Now the company has added the new Ford EcoSport variant with manual transmission option and Titanium+ trim with the petrol engine in its lineup. This trim was available earlier with automatic transmission only. The new variant is bound to attract more buyers for the second best selling sub 4-meter compact SUV in the Indian market. The new Titanium+ trim with petrol engine and manual transmission is priced at Rs. 10.47 lakh (ex-showroom). The Ford EcoSport was well received by the market at its launch last year. However, it has also faced tough challenges from the likes of Honda, Maruti, Mahindra and Tata Motors. The Maruti Suzuki Vitara Brezza is the main rival of the Ford EcoSport. However, the compact SUV from Ford Motors regained the second position in the market last month surpassing Tata Nexon and Honda WR-V. The Ford EcoSport comes with a new three cylinder 1.5 litre Dragon family naturally aspirated Ti-VCT petrol engine under the hood which churns out 123 PS power and peak torque of 150 Nm. The petrol variant with top trim gets options of 5-speed manual and 6-speed automatic transmission with paddle shift. The compact SUV also gets cruise control with adjustable speed limiter device. The new compact SUV boasts premium leather interior. Other features of the Ford EcoSport include push/button start/stop, smart entry with capacitive sensor, automatic projector headlamps with daytime running lights, rear view camera, rain sensing wiper and electric power assisted steering. The variant also comes with features like ISOFIX hooks for the child seat, side and curtain airbags, ABS, EBD tyre, pressure monitoring system, traction control, armrest with storage etc. The touch screen infotainment system with SYNC 3.0 comes features Android Auto and Apple CarPlay integration. Ford Motors has total eleven variants in the market including the petrol and diesel engine options. 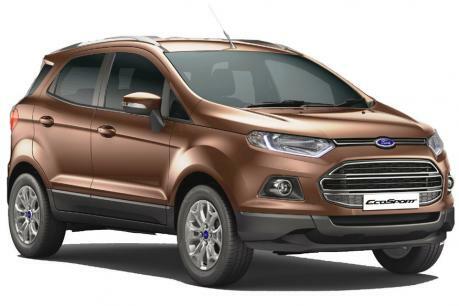 It is also likely to add a sportier version of the Ford EcoSport compact car in near future. It would continue to maintain the excitement in the coming days with the launch of the new variant and the sportier version being in the offing. Previous Watch Out! These 5 New TVS Bikes are Grabbing Attentions!